This was a funny, bittersweet and totally delightful novel! Perfect for a holiday read. I loved the British humor and Josie Silver’s breezy writing style. And when I realized that she also writes under name of Kat French, I loved this book even more! Laurie is a young, ambitious, hard-working woman, searching for her dream job when, after a particularly rough day, spots a handsome man though her bus window. He sees her, too, but misses the bus. This sounds cliche but the moment worked and served as the launching point for the story. Laurie and her best friend Sarah spend months searching for her dream man. But Jack turns up in Laurie’s life in the most unexpected way. This book is not a love triangle and the central relationship to me was actually between Laurie and Sarah. They are loyal friends and both were extremely likable and relateable characters. The story unfolds over several years and is a lovely tale missed chances, love and friendship. New relationships come and go and Laurie realizes she must get on with her own life and put her fantasy of her dream man behind her. Josie Silver created a wonderful book about real people and real friendships, mixed in with lots of humor and romance. I loved how loyal Laurie was to her best friend Sarah. Yes there are unexpected twists in this book but it was a wonderfully poignant and bittersweet story. 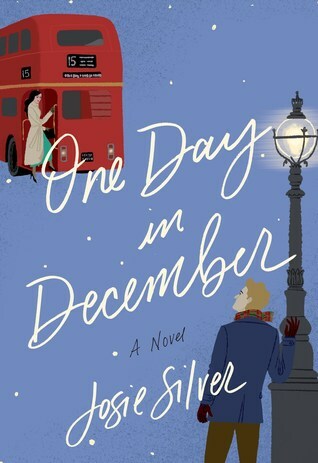 ‘One Day in December’ is a light, unexpectedly warm-hearted novel that ends on a perfectly romantic note. I love stories about “what might have been” and this was beautiful. ‘Sometimes you just meet the right person at the wrong time,’ I say softly.